The incidence of cancer and its associated mortality are increasing globally, indicating an urgent need to develop even more effective and sensitive sets of biomarkers that could help in early diagnosis and consequent intervention. Given that many cellular processes are carried out by proteins, cancer research has recently shifted toward an exploration of the full proteome for such discovery. Among the advanced methodologies that are being developed for analyzing the proteome, antibody microarrays have become a prominent tool for gathering the information required for a better understanding of disease biology, early detection, discrimination of tumors and monitoring of disease progression. Here, we review the technical aspects and challenges in the development and use of antibody microarray assays and examine recently reported applications in oncoproteomics. Over the past two decades, there have been tremendous advances in the understanding of the molecular processes by which normal cells transform into cancer and of the importance of signaling pathways in cancer initiation and progression. This progress has paved the way for the development of numerous therapeutic leads. In addition, the enormous leap in biotechnology and bioinformatics raises hopes for substantial progress in cancer diagnosis and treatment. Despite the increased knowledge and improved technical capabilities, however, global mortality from cancer is projected to continue rising, mainly because of the aging of the population, with an estimated 9 million people dying from cancer in 2015 and 11.4 million in 2030 . A major obstacle to the reversion of this trend is the fact that cancer is frequently detectable only at late stages. Current cancer diagnosis also still relies on the testing of classical cancer markers, such as cancer antigen (CA)-125, CA19-9, CA72-4 and carcinoembryonic antigen (CEA), in combination with histopathological examination of tissue biopsies. Furthermore, there is a growing need for individual monitoring of the response to therapy and disease progression, as the effect of a particular treatment is not uniform among affected subjects with the same diagnosis. In consequence, approaches are urgently required that enhance the power of detection and diagnosis of cancer at early stages. Prompted by the sequencing of the human genome, high-throughput technologies have evolved, shifting attention towards a non-reductionist approach to investigating biological phenomena. The explosion of interest in exploring the genome and proteome for biomarkers has already provided a better understanding of the molecular basis of cancer. Among the high-throughput technologies, DNA analysis by microarrays  and, more recently, second-generation sequencing  have become prominent approaches. However, the similarity in genetic alteration shared among various cancers limits the possibility of linking the genetic portrait to a particular disease feature . The genomic sequence does not specify which proteins interact, how interactions occur or where in a cell a protein localizes under various conditions. Transcript abundance levels do not necessarily correlate with protein abundance , and frequently one cannot tell from the sequence whether a gene is translated into protein or rather functions as RNA. Recent developments in genetic analysis have been paralleled by a surge in interest in the comprehensive study of proteins and protein networks. From a biomedical perspective, the field of proteomics has great potential because most pharmacological interventions and diagnostic tests are directed at proteins rather than genes. The inherent advantage of proteomics over genomics is that the identified protein itself is the biological end-product . There are several sophisticated technologies that enable proteome-wide analysis of multiple proteins in a variety of specimens. Among these, two-dimensional gel electrophoresis and mass spectrometry have been widely used and have evolved into indispensable tools for proteomic research [7, 8]. Optimization processes have been significantly improved with regard to their performance at handling small sample sizes and analyzing complex protein mixtures . However, they still suffer from limitations in terms of resolution, sensitivity and reproducibility, high cost and the great amount of time and labor required. Affinity protein-array technology seems to be a promising tool to overcome some of these limitations. 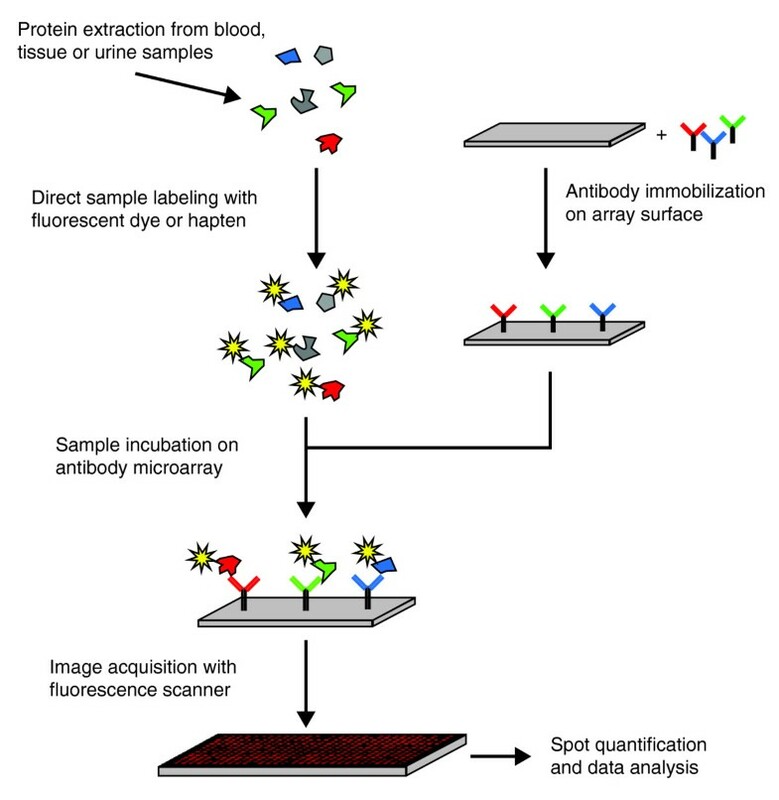 Antibody microarrays are miniaturized analytical systems generated by spatially arraying small amounts (volumes at a picoliter scale or less) of individual capture molecules, mostly antibodies, onto a solid support (Figure 1) [10–14]. So far, the number of antibodies has varied from a few to several hundred. Upon incubation with a protein sample, bound antigens are detected by fluorescence detection or surface plasmon resonance, for example. The acquired signal intensity images are converted to numerical values reflecting the protein profiles within the samples. Assay sensitivities in the picomole to femtomole range have been reported [15, 16]. Although antibody microarrays were introduced after DNA microarrays, the feasibility of miniaturized and multiplexed immunoassays was first reported and discussed by Ekins in the late 1980s [17, 18]. The technical factors that determine the set-up of a high-performing antibody microarray are the array surface, the antibodies, sample processing, incubation and signal generation and data analysis. Schematic diagram of the basic processes of analyzing protein extracts on antibody microarrays. Although many details such as the binder type, the protein labeling, the surface structure of the solid support or the detection procedure may change considerably, the principal components and steps of the assay remain the same. The choice of surface is critical for array performance because, unlike DNA, proteins are very divergent and inhomogeneous in structure and properties and prone to loss of function by denaturation and/or modification . The most frequently used solid supports for antibody microarrays are microscopic glass, plastic or silicon slides that are coated with a variety of substrates [20–22]. Examples of chemical substrates are nitrocellulose, aldehydes, amino-polyethylene glycol, Ni-nitrilotriacetic acid, streptavidin, epoxysilane and polyacrylamide-gel coatings. The choice of a specific substrate depends on several factors, such as the complexity and nature of the analyzed sample (whether it consists of individual proteins, proteins from plasma or other body liquids, or samples from cultured cells or tissues), the mode of antibody coupling, biocompatibility and array density. In addition to flat slides, arrays using nanovials and attovials  have been used in an attempt to enhance sensitivity and multiplexing. There are several types of affinity reagents that can act as capture molecules, such as monoclonal and polyclonal antibodies, recombinant antibody fragments (scFab, scFv, and so on), binders with different scaffolds (such as affibodies or anchorins), nucleic acid scaffolds (aptamers), peptides and small chemical entities . Each molecule class has its advantages and disadvantages. Nevertheless, currently antibodies and antibody fragments continue to be the most attractive affinity probes. Mono-specific polyclonal antibodies  are attractive because of the cooperative effect obtained from the generation of a mixture of antibodies to several epitopes of the target protein. This allows more antibodies to bind to each target, concomitantly improving affinity, and makes the binding assay less dependent on a single epitope. This is particularly important for multi-platform applications, in which the protein target may be denatured in different ways by factors such as detergent, alcohol, formalin or mechanical stress. So far, the vast majority of microarrays have been generated using monoclonal and polyclonal antibodies from commercial sources. Concerns are rising, however, over how many of these commercial antibodies meet the expected performance and specificity requirements . In addition, there is an imbalance in representation. Hundreds of antibodies exist against particular targets - for instance, more than 900 antibodies for p53 - whereas none are available for many others. Recombinant-antibody phage-display libraries have been suggested as a way to reduce the limitations associated with monoclonal and polyclonal antibodies in terms of specificity, functionality, stability and availability [10, 14]. Furthermore, programs have been initiated for the creation of a global resource of well characterized affinity reagents for an analysis of the human proteome, most prominently the Swedish Human Proteome Atlas project  or, transnationally, the European ProteomeBinders consortium . In any proteomic study, sample preparation is a critical factor. Owing to the complexity of the proteome, the enormous dynamic range in concentration and the susceptibility of proteins to minimal changes in the milieu and the relative abundance in a mixture, processing a sample for proteomic analysis is a challenging task. The majority of recent antibody microarray applications studied serum samples. However, other types of specimens were also targeted, such as extracts of cell surface proteins , cultured cells  or tissue biopsies . Although many reports have focused on the optimization of protocols for protein extraction from mammalian cells for gel separation and mass spectrometry , proteins for antibody microarray assays are mostly isolated by procedures long used for immunoblotting or enzyme-linked immunosorbent assays (ELISAs). Introducing an advanced protein extraction protocol that is more representative of a whole cellular proteome would be advantageous for microarray-based global protein analysis. In all proteomic approaches, sample complexity can give rise to non-specific binding and complicate uniform labeling. Strategies have been developed to remove high-abundance proteins  or to fractionate the proteins  in order to reduce complexity. Subsequent to isolation, samples are further processed by labeling either directly with fluorescent dyes or indirectly with biotin or biotin derivatives. Biotin is recognized by labeled streptavidin. Testing of labeling tags showed a superior sensitivity and signal-to-background ratio when samples were labeled with biotin [34, 35]. However, although sample-labeling approaches allow high-sensitivity detection in the picomole to femtomole range, there are some concerns regarding the introduction of too many label molecules, which might affect the antibody-antigen binding capacity. There are several label-free detection techniques that bypass labeling complications. The oldest one is the sandwich approach known from ELISA, in which two antibodies are used for selective binding to a specific protein. An arrayed antibody serves as capture reagent. Upon protein binding, the bound molecule is detected by the second antibody, which carries the label directly or is identified by a third, labeled antibody. However, since the process necessitates a working pair of antibodies for each individual analyte, technological issues prevent this approach for multiplex arrays that consist of several hundreds to thousands of antibodies. Emerging methods use matrix assisted laser desorption ionization time-of-flight (MALDI-TOF) mass spectrometry , surface plasmon resonance , nanowires , microcantilevers , quartz crystal microbalances  or light scattering  for read-out. However, with fluorescence-based array detection approaching single-molecule sensitivity , the alternative methods still need to prove their practical feasibility and competitiveness. Incubation conditions have been found to be critical for analysis, especially in view of the huge dynamic range of protein concentrations. Mass transport and kinetics are crucial for reproducible and sensitive studies . Appropriate mixing, for example, is of critical importance to such ends . Data analysis and interpretation are usually carried out using approaches adopted directly from DNA microarray studies. Data normalization can be tackled with a variety of methods, such as an internally normalized ratio algorithm following dual-color labeling , spike-in protein control(s) of known concentration, and relative normalization to a particular analyte assayed independently by other methods (such as ELISA) . In addition to measurements at equilibrium, new technology enables the analysis of association and particularly dissociation , adding extra quality to the analysis. Although still very much under development, the antibody microarray technique has already shown wide application potential for clinical cancer research and diagnostics . Table 1 lists some recent applications of antibody microarrays in oncoproteomics. The antibody platforms had either been fabricated in-house or obtained from commercial sources. The number of binders varied from a few tens, as in the analysis of cytokine networks  or functional pathways , to hundreds, as in studies focused on a more global protein expression analysis [29, 30, 48]. Several sources of samples have been used, including culture cell extracts [29, 49–51], dissected tissue biopsies [25, 51–53], exhaled breath  and body fluids [30, 54–60]. Nevertheless, the most studied specimens were sera taken from both cancer patients and healthy controls [30, 54–56, 58–60]. The rationale is that serum reflects the body's whole cellular metabolic harvest, and leakage of proteins from a particular organ or group of cells to the circulation provides some reflection of biochemical alterations during disease. In addition, in more technical terms, protein complexity is relatively low in serum and protein extraction is easy to perform. Hudelist et al. used antibody microarrays for profiling expressed proteins in normal and malignant breast tissues. They found increased expression levels of several proteins in malignant breast tissues, such as casein kinase Ie, p53, annexin XI, the cell-cycle protein CDC25C, the general transcription initiation factor eIF-4E and mitogen-activated protein (MAP) kinase 7, using commercial arrays of 378 antibodies. In another report , 224 antibodies revealed proteins that are related to doxorubicin therapy resistance in breast cancer cell lines. A decrease in the expression of MAP kinase-activated monophosphotyrosine, cyclin D2, cytokeratin 18, cyclin B1 and heterogeneous nuclear ribonucleoprotein m3-m4 was found to be associated with doxorubicin resistance. Other recent investigations helped identify a marker involved in invasion (interleukin (IL)-8) . Studying the serum proteome from metastatic breast cancer patients and healthy controls with recombinant single-chain variable fragment (scFv) microarrays , breast cancer was identified with a specificity and sensitivity of 85% on the basis of 129 serum analytes. In bladder cancer, an array of 254 antibodies showed 93.7% sensitivity to discriminate between serum samples of 58 healthy subjects versus 37 bladder cancer patients . The impact of radiation treatment was evaluated in LoVo colon carcinoma cells . An array of 146 antibodies showed increased expression of apoptosis regulators paralleled by downregulation of CEA, pointing to a possible application for monitoring response to radiation therapy in colon cancer. In colorectal cancer, the marker IPO-38 , cytokeratin 13, calcineurin, the serine/threonine kinase CHK1, clathrin light chain, MAP kinase 3, phosphoprotein tyrosine kinase 2 (also called focal adhesion kinase, phosphorylated at Ser-910) and the p53 regulator MDM2  were found as possible biomarkers. They were further validated with standard protocols such as ELISA, immunoblotting, immunohistochemistry and MALDI-TOF/TOF mass spectroscopy. However, the number of patients evaluated in these colorectal cancer studies was low. The application of antibody microarrays to prostate cancer also identified several potential marker proteins [65, 66]. Analysis of cytokines from prostate fluid of patients with minimal and maximal cancer volume revealed a possibility for early detection of the disease . Several publications have recently reported the use of antibody microarrays in assessing markers of lung cancer, which is the leading cancer-related cause of death. Kullmann et al. tested cytokine profiles with a 120-antibody array in breath condensates of 50 smoking lung cancer patients and 25 smokers without clinical or radiological sign of a pulmonary tumor and were able to differentiate the two groups by nine cytokines, including eotaxin, fibroblast growth factors, IL-10 and macrophage inflammatory protein (MIP)-3. However, the results were not stratified according to stages and histological subtypes owing to the use of pooled samples. Gao et al. constructed an array of 48 antibodies against distinctive serum proteins. They analyzed 24 newly diagnosed subjects with lung cancer, 24 healthy controls and 32 subjects with chronic obstructive pulmonary disease. C-reactive protein, serum amyloid A, mucin 1 and α1-antitrypsin were among the proteins that showed higher abundances in the lung cancer samples than in the control samples. Pancreatic cancer has received much attention, being one of the most deadly forms of cancer with basically no current treatment available. Initial observations of serum profiles came from Haab and colleagues , revealing individual and combined protein markers associated with pancreatic cancer and variations in specific glycans on multiple proteins. In another study from the same group , antibody microarrays were used to analyze post-translation modification of serum protein in pancreatic cancer patients. By profiling both protein and glycan variations , they found cancer-associated glycan alteration on the proteins MUC1 and CEA . The Borrebaeck group  used an array of recombinant scFv antibodies in an attempt to classify sera derived from pancreatic adenocarcinoma patients versus samples from healthy subjects. They reported a protein signature based on 19 non-redundant analytes discriminating between cancer patients and healthy subjects. The antibody microarray is a technology that still requires maturation. Although some technical factors have been dealt with, others remain to be optimized. In particular, appropriate binders need to be produced and validated. However, from the initial and mostly still rather preliminary studies, one can already conclude that important information can be gathered in an efficient and probably even quantitative process. The technology has the advantage of targeting the actual effector molecules of many biochemical processes, thus providing information that is of immediate clinical relevance. Sensitivity issues should be overcome by new detection modes, which could enable sensitivity up to the level of counting individual molecules. The method's practical usefulness will be particularly enhanced once the analysis of samples obtained by non-invasive means provides the required clinical information. As is the case for other profiling procedures, indirect biomarkers - molecules that indicate a cellular state without necessarily being the cause for it - provide only limited diagnostic and prognostic accuracy if studied individually. Indeed, the use of multiple biomarkers rather than a single one improves diagnostic accuracy, enhances the predictive power for patient outcome and may enable adequate monitoring of the response to treatment. Because of the decisive role of proteins in cellular activities, antibody or other binder microarrays have the potential to quickly become a routine diagnostic tool, eventually even in relatively simple formats with few binder molecules. Financial support of the authors' experimental work by the NGFN program of the German Federal Ministry of Education and Research (BMBF) and the EU projects MolTools, DropTop and Proteome-Binders is gratefully acknowledged. MSSA received a long-term fellowship of the Deutscher Akademischer Austausch Dienst.